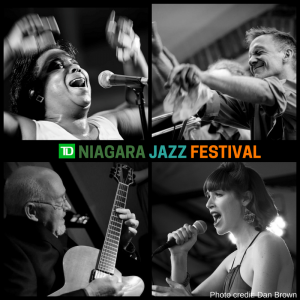 Recently voted ‘Best New Festival in Ontario’, the TD Niagara Jazz Festival is a new and exciting jazz festival dedicated to celebrating the art form of jazz in the Niagara Region. They inspire, educate and develop future jazz audiences for generations to come, while combining live jazz with a Niagara experience – food, wine, culture and natural wonders. For its 5th season the TD Niagara Jazz Festival is currently working on its line up, which will be released in early 2018. S​ome select performers from the 2014, 2015, 2016 & 2017 festivals include: Pat LaBarbera, Heather Bambrick, Kevin Turcotte, Brian Dickinson, June Garber, Cinnamon Jones, Heavyweights Brass Band, Michael Kaeshammer, the Shuffle Demons, Barbra Lica, John Sherwood, Ashley St. Pierre, Graham Lear, Red Light Sessions and many more. Over to 500 jazz artists have already graced the TD NJF stages and the festival looks forward to bringing many more artists to showcase at the festival.